I had the pleasure of talking with Elf Island's founder, Liz Kronenberger not too long ago, after I asked one of my PR reps to let her associates know that I was looking for products to review for my Summer Soiree'. Liz was so nice on the phone, and the things she told me about Elf Island honestly blew me away. worlds for kids. From their professional experiences in the kids’ entertainment space, Liz and Craig decided to blend their entrepreneurial spirit with their philanthropic passions. Knowing that kids were flocking online to play, Liz and Craig saw a great opportunity to build something that would entertain, while at the same time fulfill and foster strong social values. Prompted to act, the Kronenbergers launched Elf Island in 2007, the first virtual world to use games, storytelling and social interaction to empower kids to make a positive difference in the real world. Liz and Craig Kronenberger are committed to creating a fun place for kids that enables them to give back, influence communities and environments, all through the entertaining world of Elf Island. It’s empowerment through online fun. • Gaming for Good™ describes this new category of gaming with a higher purpose. Kids have the power to change the world– all while having fun! All they need is the proper motivation, the correct tools and the opportunity to do Good. We call this type of game play Gaming for Good - giving higher meaning to virtual fun and entertainment. reflecting that same good offline. Elf Island works directly with select non-profit partner to determine real world projects to support, and then mirrors an online GoodQuest™ game to bring the project to life. Kids get to hear, see and tell the stories of others and ultimately witness the affect they can make by helping, creating real results. Unlike other virtual world’s, Elf Island is a true hybrid of game play and social community. In this virtual world, kids have endless opportunities to personalize their journeys and ultimately learn the secret to Elf Island. Kids game play is rewarded and they get to witness - through photos or videos- how their actions affect change in both the virtual and the real world. [Mirrored Gaming]. The more kids are Gaming for Good within Elf Island the more Elf Island is revealed. include gender, hairstyles, skin, hair, clothing and eye color. joining a tribe or starting a tribe. The kids maintain their individual identities, but gain a strong sense of belonging. • Kids are empowered when their online play has a real purpose and they see thebenefit to the world around them through their efforts. • Elf avatars have eight different action sequences: walking running, sitting, flying, jumping, rolling, arm movement and a related breathing state. Kids have the opportunity to learn about our real world through social involvement, cultural immersion, education and artistic expression. through writing, artwork and photos (user-generated content). Elf Island is a place where parents feel good about where their kids are playing Online. maintained and enforced at all times. Working with selected non-profit partners, Elf Island identifies a real world project to support in the virtual world. 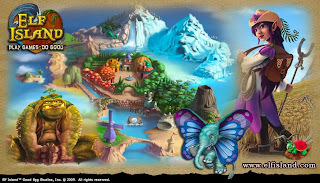 Elf Island creates online games called GoodQuests focused on these initiatives to bring the projects to life in the virtual world. Mirrored Gaming engages, entertains and rewards kids for making an impact in the real world by immersing them in the needs of real people, animals and the Earth. By propelling it’s non-profit partners’ missions through Mirrored Gaming, Elf Island is enabling kids to learn how to give, how to be good citizens and how to turn their gaming actions into a real world of Good. Kids feel the empowerment and become inspired to see the results and help change our world. • Polar Bears International: Mirrored game – Tracking virtual polar bears and polar ice caps helps protect real polar bears and their environments in the Artic. productivity and sustainability of farmers in Kyrgyzstan. • Plant-It 2020: Mirrored game - Planting virtual trees helps plant real trees in Niger. More Elf Island non-profit partners are being sought and will launch continuously through rolling campaigns. Although kids can enjoy the basic offerings of Elf Island for free, they will not have the same magical experiences as a member. participate in game play. Kids also have the unique ability to unveil secret passageways, communicate with hybrid-animals, join a tribe, participate in an economic marketplace and ultimately learn the Secret of Elf Island. A membership costs $5.95 USD per month; however, reduced rates are available with six-month and one-year memberships. Elf Island is different than most companies in that it doesn't simply take a percentage of profit and make a donation. The money allocated to fund each of the GoodQuests is tied directly to the performance of the kids playing and not to profits of the company. The financial commitments to Elf Island’s non-profit partners are part of the day-to-day operating budgets and each program requires a different level of funding. Elf Island is created for kid’s 8-15 years old. Kids of all ages are welcome, especially those who care about changing our world. I'm all about creating awareness in kids. Throughout my current stint as a blogger, I've been exposed to the Green Initiative in ways that I couldn't imagine previously. I've always been aware of Animal Rights - if you've seen photos of my Living Room, you will notice that it's wild animal enhanced. Why? Because I love Tigers, and am appalled that most of them have been killed, leaving a small number of Tigers in the wild. I'm on the PETA mailing list. I'm considering becoming a vegetarian. I've also written letters to lawmakers regarding Tigers, Wolves, Canadian Seals, and Polar Bears. I'm not perfect, but I am aware. When I spoke with Liz on the phone and she told me about Elf Island and how it's giving back, I was thrilled. What a great website! To take something as simple as an online game for children and use it as an avenue to give back - that's incredible! My daughter plays Webkins, Cublings, and the Penguin Club, and since she's 10 and doesn't get the whole don't tell anyone anything about you thing, I'm constantly worried about her being online and I have to watch what she's doing on the computer at all times. One of the main things that I love about Elf Island is that there are moderators for the chat component of the site, as well as certain words that are not allowed. I encourage you to get involved, and to teach your children to get involved - and Elf Island is a good way to start. Elf Island founders have graciously offered to give away 3 memberships to Elf Island. How do you enter? Tell me who you want to give this membership to and why. Then fill out the form below. For extra entries, follow Elf Island on Twitter and become a Fan of Elf Island on Facebook. *Be sure to mark the corresponding checkboxes if you have completed these extra entries!